Access to and use of this World Wide Web site ("QSound Web site") is provided subject to the following terms and conditions, which may be amended from time to time at QSound’s sole discretion. The information, artwork, text, video, audio, or pictures (collectively "Information") contained on the QSound Web site are the copyrighted works of QSound or its suppliers. Copyright ©1992-2010 QSound Labs, Inc. All rights reserved. Some of the sample files on this site originated under license from The Hollywood Edge Sound effects library and are copyright The Hollywood Edge. QSound versions of these samples are copyright © 1999 QSound Labs, Inc. and may be used only under license from QSound Labs, Inc. and The Hollywood Edge. You may not modify or alter the Information in any way without express written permission from QSound. Any computer software downloadable or otherwise available from QSound is licensed subject to the terms of the applicable license agreement. The Information does not include design or layout of the QSound Web site, elements of which are protected by law and cannot be copied or imitated. All media files on the QSound Web site are protected by copyright laws. You may not, under any circumstances, reproduce, record, publish, publicly exhibit, or distribute any media files (including, but not limited to, .ra, or .rm, .asf or .asx files) made available for playback on the QSound Web site without QSound's express written consent. You may not link directly to any of the above media files located on a QSound server, and you should not attempt to "pass-off" any of QSound’s content as your own work. EXCEPT AS EXPRESSLY PROVIDED OTHERWISE HEREIN, ALL INFORMATION AND SOFTWARE ON THIS WEB SITE IS PROVIDED "AS IS" WITHOUT WARRANTY OF ANY KIND, EITHER EXPRESS OR IMPLIED, INCLUDING, BUT NOT LIMITED TO, THE IMPLIED WARRANTIES OF MERCHANTABILITY, FITNESS FOR A PARTICULAR PURPOSE, OR NON-INFRINGEMENT. QSOUND ASSUMES NO RESPONSIBILITY FOR ERRORS OR OMISSIONS IN THE INFORMATION OR SOFTWARE OR OTHER DOCUMENTS WHICH ARE REFERENCED BY OR LINKED TO THIS WEB SITE. REFERENCES TO CORPORATIONS, THEIR SERVICES AND PRODUCTS, ARE PROVIDED "AS IS" WITHOUT WARRANTY OF ANY KIND, EITHER EXPRESS OR IMPLIED. IN NO EVENT SHALL QSOUND OR ANY OF ITS AFFILIATES, EMPLOYEES, OFFICERS, DIRECTORS, AGENTS OR REPRESENTATIVES BE LIABLE FOR ANY SPECIAL, INCIDENTAL, INDIRECT OR CONSEQUENTIAL OR OTHER DAMAGES OF ANY KIND INCLUDING, WITHOUT LIMITATION, THOSE RESULTING FROM DAMAGE TO OR LOSS OF USE OF COMPUTER HARDWARE, DATA OR INFORMATION OR LOSS OF PROFITS, WHETHER OR NOT ADVISED OF THE POSSIBILITY OF DAMAGE, AND ON ANY THEORY OF LIABILITY, ARISING OUT OF OR IN CONNECTION WITH THE USE OR PERFORMANCE OF THIS INFORMATION. The QSound Web site contains links to third-party Web sites, which are not under the control of QSound. QSound provides these links as a convenience only and QSound does intend these links to be endorsements or referrals of these linked sites. QSound does not accept any responsibility for the content or uses of these linked Web sites. QSound’s Copyright Agent is Joanna Varvos, who can be reached at joanna.varvos@qsound.com or by mail at 102 – 2816 11th Street NE, Calgary, AB T2E 7S7 or by telephone at (403) 291-2492. Certain information on this Web site contains forward-looking statements within the meaning of the Private Securities Litigation Act of 1995 concerning, among other things, the anticipated introduction of new products and services, projected shipment dates of products, plans for future operations, future financial results and assumptions relating to the foregoing. You are cautioned that such forward-looking statements involve risk and uncertainties, which could cause actual results, performance or achievements of QSound, or industry results to differ materially from those reflected in the forward-looking statements. Such risks and uncertainties include, but are not limited to, risks associated with the availability of sufficient resources for QSound to timely cost and effectively carry out its business plans and strategies, the commercialization of QSound’s technologies, dependence on the performance of third parties who have licensed or have agreed to market QSound’s technologies, dependence on intellectual property, uncertainties relating to product development and commercial introduction, manufacturing uncertainties, rapid technological change and competition, continued growth of the internet and other risks detailed from time to time in QSound’s periodic reports filed with the Securities and Exchange Commission. The QSound Web site (excluding linked sites) is controlled by QSound from its offices in the Province of Alberta, Canada. All matters relating to your access to, or use of, this Website shall be governed by the statutes and laws of the Province of Alberta, without regard to the conflicts of laws principles thereof. 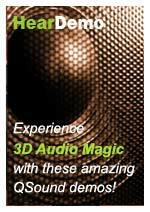 3D Audio That Works, QSound, Q logo, QXpander, Virtual Audio, Screaming 3D Audio, affiliateDirect, AudioPix, ChoiceMall, ChoiceWorld, QDVD, iQms2, microQ, QTelNet, Qmp3D, QSYS/TDM, QX/TDM, QXSDII, QSystem, Q123, QCreator, QMixer, QMDX, Q1, Q2, Q3, Q4, QMSS, QEM, Q3D-Graphics, Q3DInteractive, QSound 3D Interactive, QX, Q2X, iQ, iQfx, iQfx2, iQfx3, iQms, QVerb, QBass, QMax, QMaxII, QDVD, QSurround, QSoft3D, Q3D, QHD, UltraQ, QSys, QTools/AX, QTools/SF and QCommerce are trademarks of QSound Labs, Inc. Some of these trademarks are registered in certain jurisdictions. You may not use any of QSound’s trademarks without express written permission of QSound. If you are interested in using our trademarks, please contact the webmaster@qsound.com.